A small portion of collagen, colored by atom (left) and colored to highlight the three chains (right). About one quarter of all of the protein in your body is collagen. Collagen is a major structural protein, forming molecular cables that strengthen the tendons and resilient sheets that support the skin and internal organs. Bones and teeth are made by adding mineral crystals to collagen. Collagen provides structure to our bodies, protecting and supporting the softer tissues and connecting them with the skeleton. But, in spite of its critical function in the body, collagen is a relatively simple protein. Collagen is composed of three chains, wound together in a tight triple helix. The illustration included here shows only a small segment of the entire molecule--each chain is over 1400 amino acids long and only about 20 are shown here. A repeated sequence of three amino acids forms this sturdy structure. Every third amino acid is glycine, a small amino acid that fits perfectly inside the helix. Many of the remaining positions in the chain are filled by two unexpected amino acids: proline and a modified version of proline, hydroxyproline. We wouldn't expect proline to be this common, because it forms a kink in the polypeptide chain that is difficult to accommodate in typical globular proteins. But, as you can see in the examples below, it seems to be just the right shape for this structural protein. Hydroxyproline, which is critical for collagen stability, is created by modifying normal proline amino acids after the collagen chain is built. The reaction requires vitamin C to assist in the addition of oxygen. Unfortunately, we cannot make vitamin C within our bodies, and if we don't get enough in our diet, the results can be disastrous. Vitamin C deficiency slows the production of hydroxyproline and stops the construction of new collagen, ultimately causing scurvy. The symptoms of scurvy--loss of teeth and easy bruising--are caused by the lack of collagen to repair the wear-and-tear caused by everyday activities. Collagen from livestock animals is a familiar ingredient for cooking. Like most proteins, when collagen is heated, it loses all of its structure. The triple helix unwinds and the chains separate. Then, when this denatured mass of tangled chains cools down, it soaks up all of the surrounding water like a sponge, forming gelatin. Illustration of basement membrane, with collagen in shades of blue. We make many different kinds of collagen, which form long ropes and tough sheets that are used for structural support in mature animals and as pathways for cellular movement during development. All contain a long stretch of triple helix connected to different types of ends. The simplest is merely a long triple helix, with blunt ends. These "type I" collagen molecules associate side-by-side, like fibers in a rope, to form tough fibrils. These fibrils crisscross the space between nearly every one of our cells. This illustration depicts a basement membrane, which forms a tough surface that supports the skin and many organs. A different collagen--"type IV"--forms the structural basis of this membrane. Type IV collagen has a globular head at one end and an extra tail at the other. The heads bind strongly together, head-to-head, and four collagen molecules associate together through their tails, forming an X-shaped complex. Using these two types of interactions, type IV collagen forms an extended network, shown here in light blue. Two other molecules--cross-shaped laminin (blue-green) and long, snaky proteoglycans (green)--fill in the spaces, forming a dense sheet. A special amino acid sequence makes the tight collagen triple helix particularly stable. Every third amino acid is a glycine, and many of the remaining amino acids are proline or hydroxyproline. A classic triple helix is shown here on the left, and may be viewed in the PDB file 1cag . 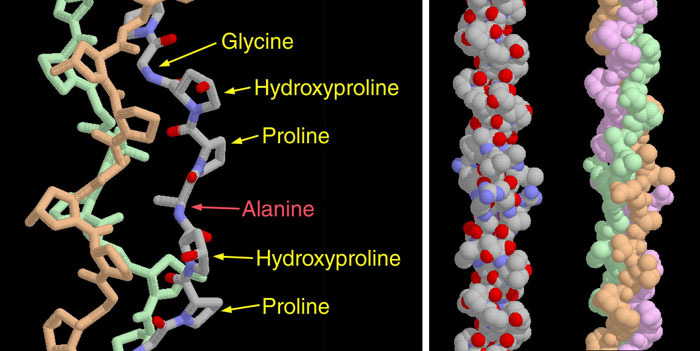 Notice how the glycine forms a tiny elbow packed inside the helix and the proline and hydroxyproline smoothly bend the chain back around the helix. In this structure, the researchers placed a larger alanine amino acid in the position normally occupied by glycine, showing that it crowds the neighboring chains. The collagen helix shown on the right contains a segment of human collagen, and may be viewed in the PDB file 1bkv . Notice that the top half is very uniform, where the sequence is the ideal mixture of glycine and prolines. At the bottom, the helix is less regular, because many different amino acids are placed between the equally-spaced glycines. Click on the image for an interactive JSmol view of this structure.